After signing a huge deal with the Los Angeles Clippers, only to be traded to the Detroit Pistons, Blake Griffin can finally settle in and not have to deal with court proceedings after a longstanding custody battle with his former fiance. According to TMZ, the two have agreed to share joint custody of their two children and co-parent for the sake of their kids., but as part of the settlement, Griffin will have to fork over a “significant” amount per month in child support, but “both sides are happy” and ready to move on with their lives. The Detroit Pistons star has been ordered to pay $258,000 per month in support for his two young children with ex Brynn Cameron, according to court documents. Griffin and Cameron have been embroiled in a nasty paternity case and a separate civil suit where Cameron claimed the NBA star broke off their engagement shortly after he started dating Jenner, when he was still part of the Los Angeles Clippers. In court documents, Cameron claimed Griffin booted her and their two children, Ford, 5, and Finn, 2 from his $12 million Pacific Palisades mansion. In a January declaration, Cameron said she was “reduced to being homeless,” and only had $100 in her personal bank account. Griffin and Cameron were locked in the battle over the NBA star’s income and assets, with Cameron claiming Griffin is “uber-rich”and should pay all costs, including her attorney’s fees, which totaled to about $375,000. According to court documents, 29-year old Griffin earned an average monthly salary of $2.2 million in 2016. 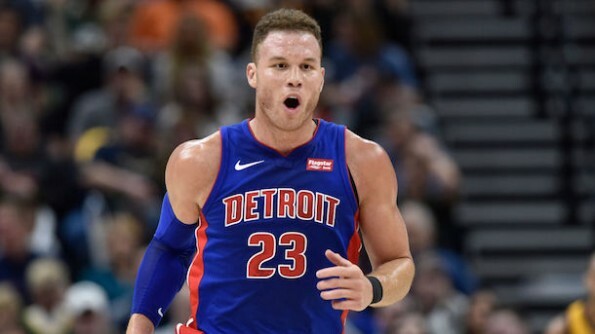 For the purposes of determining monthly child support, however, the court in March determined Griffin’s annual income from the Detroit Pistons and other sources, including his investments, to be $35 million. Griffin said as of July 23, he is paying the lease for a five-bedroom home in Manhattan Beach for Cameron and the children. The documents also stated Griffin continues to pay for medical insurance and other costs since the children were born. A judge signed an order in July 19, which stated both sides shall mutually agree on all school and additional school expenses, but Griffin will pay for the kids’ extracurricular activities. It must be noted that Griffin’s ex also has a child by former NFL quarterback Matt Leinart. Cameron still has the ongoing civil suit against Griffin where she claimed the NBA star breached their oral contract, and that court date has been scheduled for February 2019 for the civil suit.